In the two months since Gov. Peter Shumlin said he would not seek reelection, Lt. Gov. Phil Scott has been cagey about his electoral intentions. "I am considering it," he said last month of a potential gubernatorial run. "It doesn't mean that I'm going to do it. It just means I'm considering it." That consideration appears to have grown more serious. In a fundraising letter that arrived in mailboxes around the state Saturday, Scott signaled that he has his eye on higher office. "Vermont families are still struggling, which means we have more work to do, and I am preparing to step up and lead," he writes. The letter includes no explicit declaration that the Vermont Republican Party's sole statewide officeholder is mounting a gubernatorial campaign. But it comes far earlier — more than 15 months before the next election — than fundraising appeals for Scott's previous reelection campaigns. 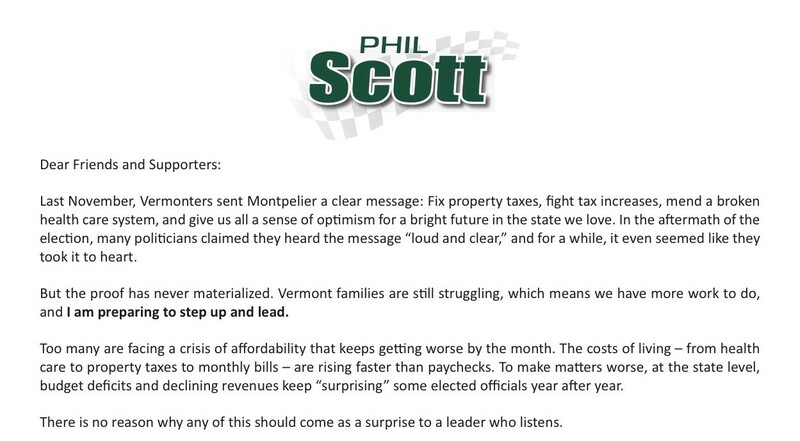 It also lays out a rationale for a potential gubernatorial bid: State government has ignored Vermonters' calls for lower taxes and better governance, Scott writes, and he's got the experience to "make state government not only more affordable, but also more effective." "As I contemplate the best way for me to serve Vermont, I need your support and — just as important — your continued input, now more than ever," he concludes. Reached Sunday afternoon, Scott said the letter is not an indication that he’s made up his mind. According to Scott, he sent the fundraising letter to 20,000 people this weekend. He expects to send another batch in the next couple of weeks and eventually hopes to reach between 40,000 and 50,000 people. How much money the potential candidate will raise from the letter won't be clear until March 2016, when candidates are next required to report fundraising information to the secretary of state. A week and a half ago, Scott reported having $98,654 in his lieutenant gubernatorial campaign account. Should he choose to run for governor, he would be permitted to spend that money on the race. Blogger John Walters first reported on the letter earlier Sunday on the Vermont Political Observer.